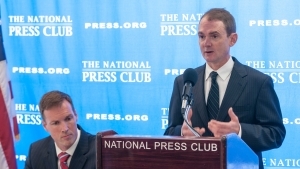 As technology matures, privacy issues are being subjected to legal tests that could force a Supreme Court Fourth Amendment review, according to Virginia attorneys Christopher Leibig and Steve Shannon who addressed their concerns during a National Press Club Newsmaker event Thursday. Global Positioning Systems in particular are being used more frequently by law enforcement officials seeking to track the movements of suspected criminals. Although law related to GPS tracking has matured in recent years, many issues surrounding the technology remain unsettled and are being argued in courtrooms across the nation. The Fourth Amendment grants citizens the right to security against unreasonable searches and seizures, but more frequently, law enforcement officers during their initial criminal investigations have been employing technological devices without seeking warrants first. "The use of a GPS device or an electronic surveillance device serves as part of the foundation for law enforcement to later get a warrant to search somebody's home or automobile,” said Shannon. "The issue is: can you do that without having a warrant?" One GPS case, United States v. Jones, reached the Supreme Court and the government’s use of a GPS device was ruled unconstitutional, but the high court has not resolved the overall issue. Until the mid-20th century, search and seizure law was rooted in the issue of common law trespass, a physical intrusion onto someone's property. Evidence obtained in that manner without a warrant was deemed to unconstitutionaly obtained and could not be used in a criminal prosecution. But with the advent of GPS tracking technology, and law enforcement access to cellphone records, the courts have begun to ponder whether criminal investigations using information gathered from such devices may breach a person's reasonable expectation of privacy, a core component of the amendment. Whether the expectation of privacy from society's perspective is reasonable is a key point in legal discussions. Such expectations are evolving rapidly. The courts are going to wrestle with this issue, Shannon said, noting that earlier this year the Virginia General Assembly passed emergency legislation that established legal guidelines for gathering information via tracking devices. Leibig said basic law regarding cellphone records is in “complete flux.” The government’s argument against the need for a warrant in cellphone investigation cases is that individuals chose to own a cellphone, voluntarily conveyed their records to a third party -— the cellphone company -- and know that the data is stored away from one’s home; therefore the individual has no reasonable expectation of privacy. Leibig said a significant opinion which could guide other courts on cellphone tracking is due soon from the 5th U.S. Circuit Court of Appeals. It will address the government’s appeal of a lower court ruling asserting that obtaining cellphone records for tracking requires a warrant.